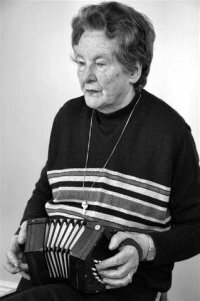 I have the news of the death of concertina player Kitty Hayes from Shanaway West on the morning of Saturday May 17th. She had phoned me just the day before; we were to play tonight at a CD launch and she was looking forward to going, play a few tunes and sing a few songs and she wondered if I was up for 'a practice'. She knew we didn't need it but she liked the company and a few tunes to 'shorten the day' as she would say. Unfortunately I had to pick up something in Ennis so we decided to chance it unprepared. We talked for a while and she was in the greatest of form, as she was a few days before, the last time we played. I had given her a few new tunes that she loved and she was raring to go and play them in public. Her story is by now well-known: Kitty grew up listening to her father and their next door neighbour, Willie Clancy's father Gilbert play together in the kitchen. As a teenager she worked her father's concertina when he wasn't looking, teaching herself the basics. At that time she was out to the house dances a lot, listening to and playing music. At some point though her concertina broke and around the same time she married flute player Josie Hayes. Raising the family and working the farm there was no money or time for a concertina and it was only in the 1990s she got back to it, after a break of nearly 45 years. I met her on the first night she played out, she was sitting in with fiddlers Junior Crehan and Michael Downes, and she sounded like she had been playing forever. Soon after, we started playing together - eight or nine years ago. We got on like a house on fire and ended up playing together almost weekly, quietly at home over a cup of tea. She had a good run of it the past few years, getting invited to play, a great television documentary in the Se mo Laoch series made by Breandan Begley and Nuala O Connor that told her story and told it well, and had us all play with her. Winter was quiet, we played mostly in the kitchen, she particularly loved it when I brought my son along, he plays the concertina and she was always trying to get a few tunes off him, especially The Hunt, which her father used to play. During a few visits my son shot a dozen or so of videos that can be seen on YouTube. Earlier this week Noel Hill played in town; I was to take her along but at the last minute she decided she'd save herself for the CD launch tonight. She got up this morning, had her cup of tea and then quietly slipped away.